In which I caption images from this blog and add relevant (but not actually linked, historically) selections from this book whenever I remember. This post was made possible by Harviestoun Brewery's Old Engine Oil. And it shows. This is a turtle as drawn by someone who had never seen a turtle but who had seen many fishes. Monk 1: So it's like a fish. 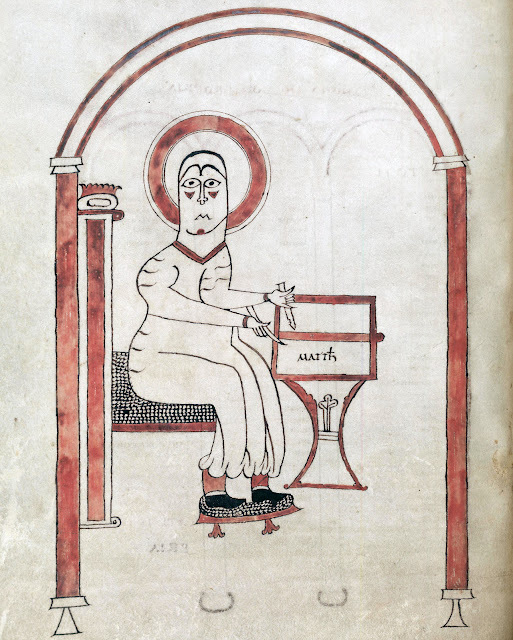 Monk 2: Yeah, except it says here it has a nose. Monk 1: Ok, nose added. Monk 2: Legs that end in flat paddles. Monk 2: And the whole thing is in a hard shell. Monk 1: Like a snail shell? Ok, I think I've got it. How does this look? Monk 2: Badass. That's definitely how I imagined a turtle. Among the Indians in the part called Keras, they say that there are small fish which wander about on dry land, and then run back again to the river. Armoured fish that live in the Brine Sea. Calcium-rich shells and decent running legs. Will happily chase down a goat and drag it back to the water. They fill the same niche as crocodiles, but evolved to combat giant herons and their armour-piercing beaks. Of course the local peasants don't give two shits about evolution or giant extinct herons or calcium shells. They just want the fish to leave their flocks and boats alone. 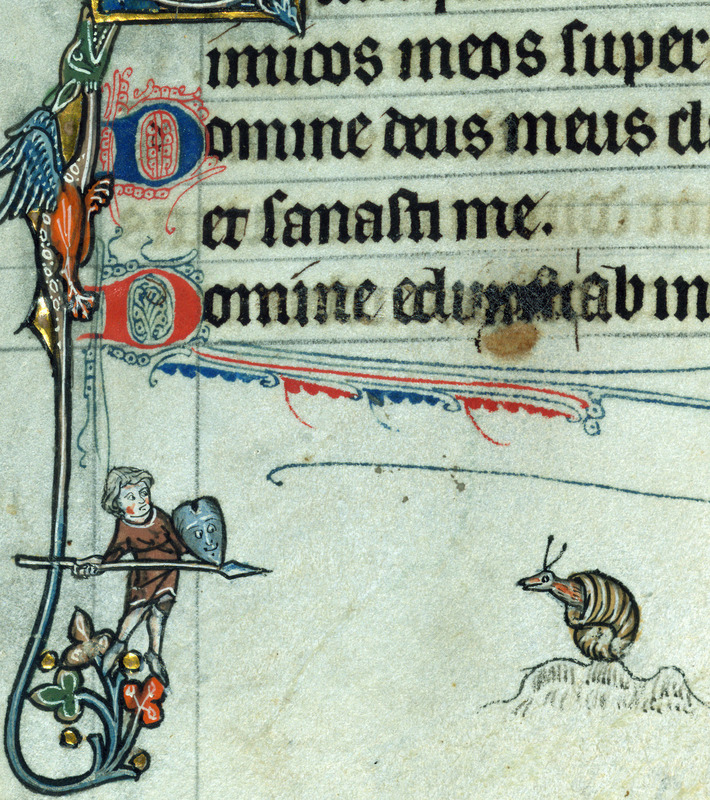 Medieval monks loved to draw knights fighting snails. We don't know why. I think it was just amusing to them; they had a sense of humour after all, and the juxtaposition is pretty hilarious. Some people think it's about the inevitability of death, but monks had plenty of other ways to show that off. This seems different. Look at that amusing little shield! And the snail itself, balanced on a hastily drawn mountain because the artist pulled a Liefeld and drew the characters before figuring out the composition. Battle Snails grow to the size of pumpkins. They don't want to fight you. They want you to fight other people. They'll eat the remains. Everyone within 10' of a Battle Snail must Save each round or attack the nearest vaguely threatening target. If there is only one target left, they might attack the Battle Snail... but it's so cute and harmless and cheerful that most sentient creatures will flee instead. Animals will simply ignore it. It's not a threat. You can usually find them gnawing on deer that have battered each other to exhaustion or eating the remains of a frantic mouse kin-slaughter. Their shells make decent helmets and their flesh makes a wonderful berzerker brew. Dogs have gods, and their gods are vaguely shaped like people. Cats are assholes and have kings instead. They say that dogs only pursue wild beasts as far as the peaks of the so‑called Black Mountains, and that, when they have followed them as far as this, they turn back. This is the King of Cats. He looks dumb because he is dumb. You think the Hapsburgs had it bad? Nobody was breeding them for looks. This guy's name is Melville and he's the end result of a careful breeding program. Every single one of his genes is recessive. Some of his genes have receeded so far that Melville is barely eukaryotic, but the aristocrats who bred him don't know what genes are. They do know that whoever controls Melville controls all cats. Mostly. Some of the time. Anyway, it's better than not controlling all of the cats. And it keeps the wild dogs away. They aren't sure how to use Melville to make money, but they're getting close to a plan. Move: 1/10th normal, if motivated. Mostly just sits there. Falls over if not propped against something. Morale: 12. 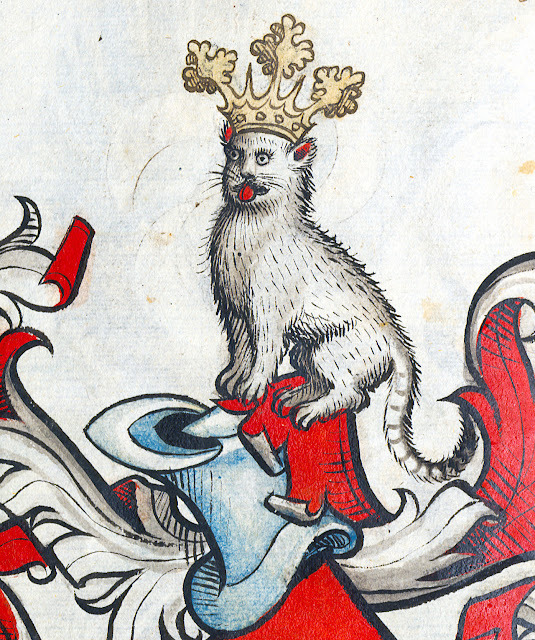 Nothing will ever frighten the King of Cats. Damage: 0. 1d6 if Melville is thrown at someone, but otherwise, he's completely harmless. He might not be aware he has claws. Whoever controls Melville controls all cats, in the same way that whoever controls a large sack of money controls all bandits. Control is transferred by Melville bonking his head into you several times. His bonks are impeded by his giant gold crown. No one, not even the aristocrats who bred him, knows where the crown came from or if it can be safely removed. Portals to other worlds are fairly easy to open. Surviving the fall is not so easy. 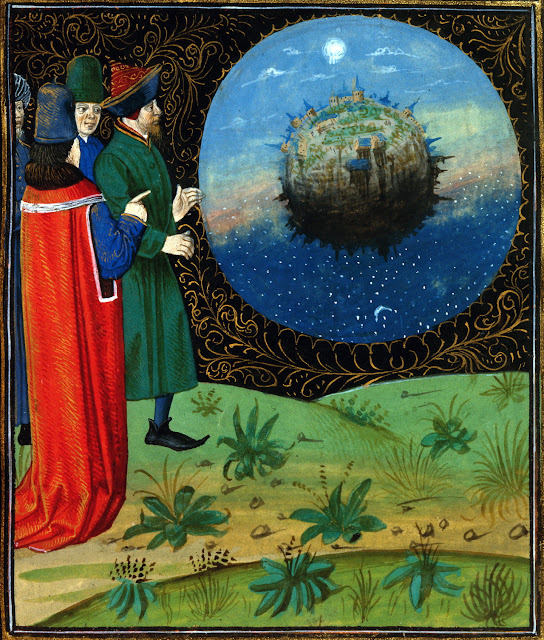 And also, most of the worlds the Astronomers have found are very tiny and full of elves. This is usually a bad thing. In Arabia they say there is a species of hyaena, which, when it sees a beast in front, or comes into the shadow of a man, produces dumbness, and such paralysis that it is impossible to move the body. It has the same effect on dogs. Snuggle Lions didn't evolve. Everyone agrees they are the sort of thing wizards inflict on the world through carelessness or spite. They are friendly, kind-hearted animals with grey-black pelts. They love human contact and will happily spend hours climbing onto humans, rubbing their heads on humans, and trying to play games with humans. There is just one problem. Snuggle Lions produce an incredibly powerful paralysis field. If they stand in a person's shadow or stare at them, the person is paralyzed and rendered mute. This isn't usually a problem. If you were stalked by a giant black lion and then suddenly paralyzed, you would probably be frightened. 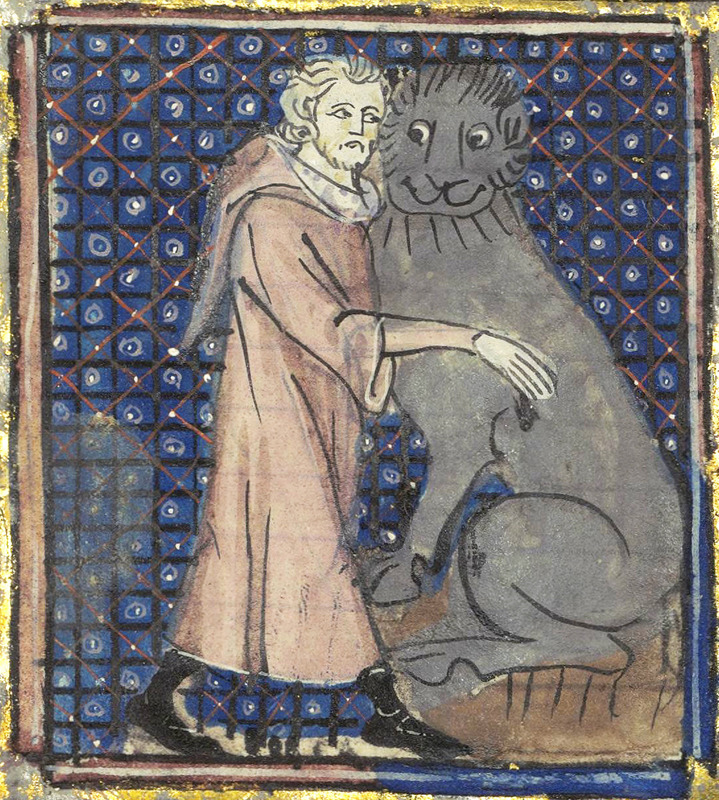 The Snuggle Lion knows you are frightened. It doesn't mind. It will bonk into you for a few hours and then leave. If you aren't afraid of the giant black lion that just ambushed you, things are less pleasant. The Snuggle Lion can smell the absence of fear. It knows that anything that doesn't fear it could be a threat. So it bonks into you a few times and then, almost sadly, bites off your head. Move: 2x normal, very stealthy. Damage: 1d6 claw / 1d6 claw / 1d8 bite. Or it just bites off your head. Dogs or humans within 30' that the Snuggle Lion can see must be Save each round or be paralyzed and unable to speak. If the Snuggle Lion is standing in your shadow you can only Save once each minute. When there's no more room in hell, the dead will walk the earth. Everyone knows that. Heaven is getting crowded. 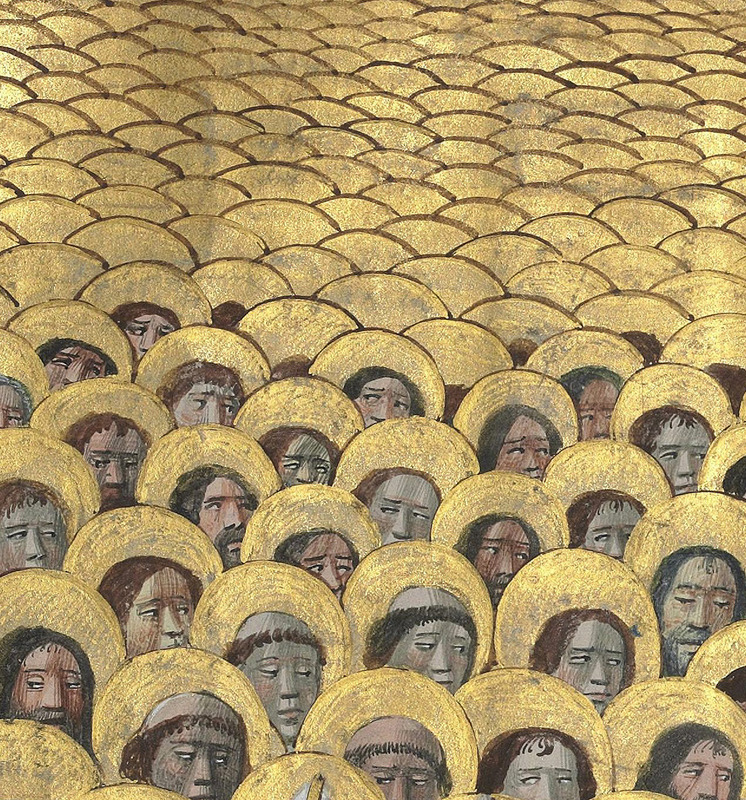 There's a small worry in theological circles that the saints will come marching back down the celestial staircase. 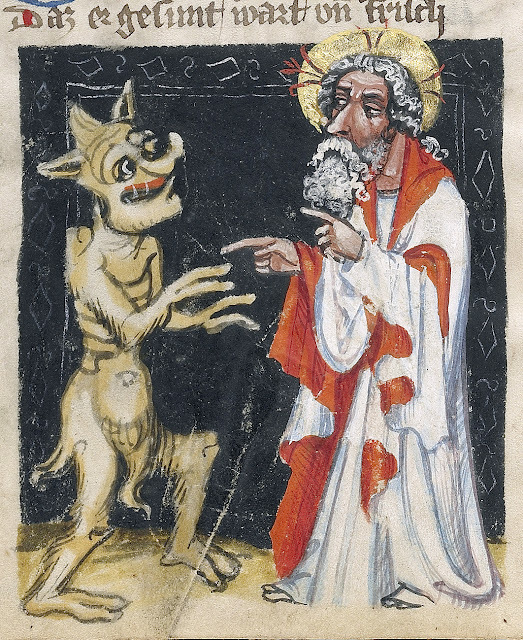 Monk 2: It says here lions are horrible flesh eating beasts with shaggy manes. Monk 1: Right. Like a horse. Monk 2: No, says here they are more like cats. Monk 1: I'm going to go with... horse. With a man's nose. And big fearsome teeth. Monk 2: You call those fearsome teeth? Lions are always in demand in menageries and fighting pits. Lions are difficult to breed and capture. Horses, on the other hand, are comparatively easy to breed. With enough patience you can make a horse look like almost anything. Many credulous nobles have purchased superb lions with shining hooves and glossy manes. 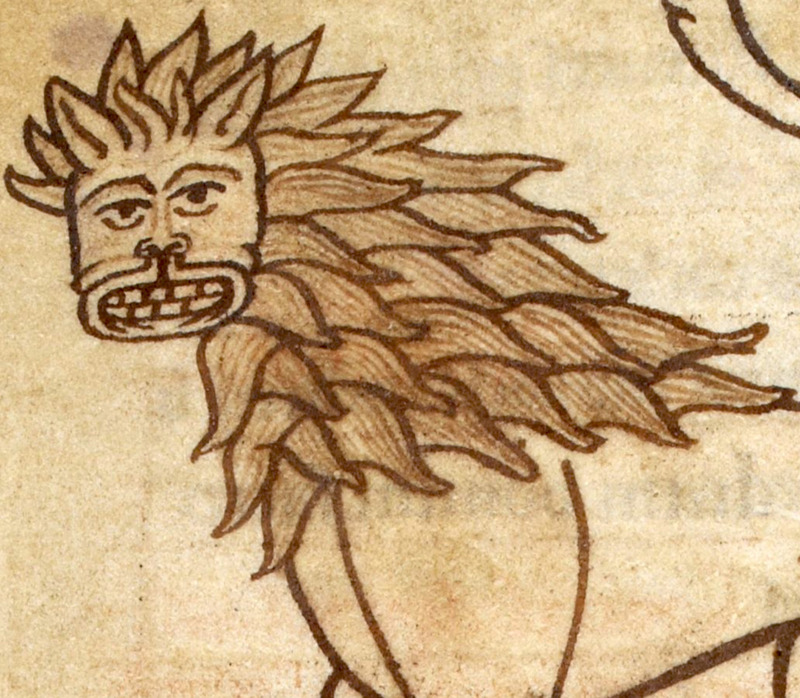 False Lions will even eat flesh, though they get no nutrition from it, and it usually gives them terrible wind. 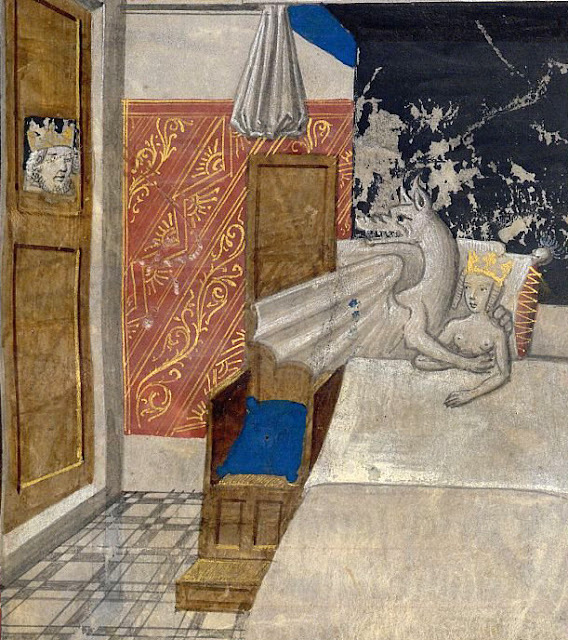 The Macedonian queen Olympias, mother of Alexander the Great, sits holding her belly as her ladies-in-waiting leave her bedchamber, unaware of the ram-headed man slinking into the room. This strange figure is actually the magician and Egyptian king Nectanebo. Most versions of the legend of Alexander claim that Nectanebo, the last native Egyptian pharoah, prophesied for Olympias that she would be visited and conceive a child by Ammon, an Egyptian god with the body of a man and a ram's head. While King Philip was away on military campaign, Nectanebo disguised himself as Ammon, visited the queen's bedroom, and impregnated her. 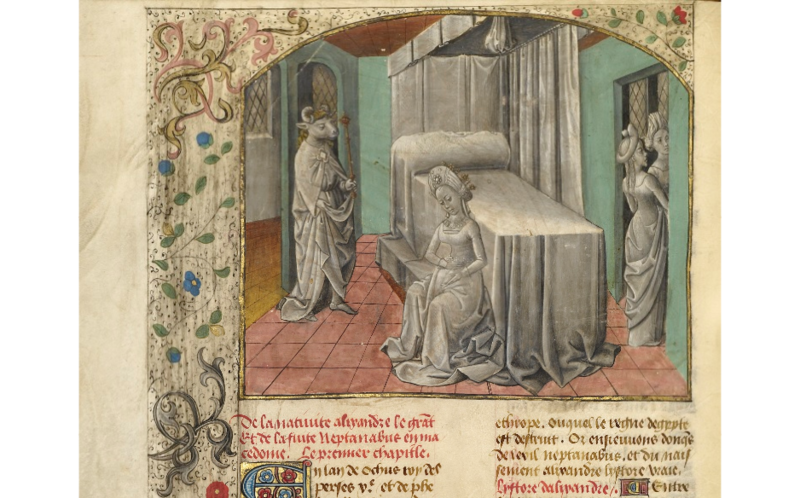 The resulting child was Alexander, whose legendary life was widely celebrated in the Middle Ages. In the Getty Museum's copy of the Mirror of History, Alexander's popular story is told in a series of eight miniatures. Alternative caption "student reacts to a math exam." Remember the Battle Snail from earlier? Some creatures are immune. Most dogs are not, but greyhounds are. Rabbits are also immune. Imagine the chaos you could cause by throwing a juvenile Battle Snail into a castle or a formation of soldiers. Rabbits are hampered by their short lifetimes and natural timidity, but they are preparing a revolutionary army one snail-grenade at a time. Rabbits freeze and stare at you because you've caught them spying. Cost: 35gp. Raised by rabbits. All creatures within 10' of the snail must Save each round or fight the nearest vaguely threatening target. 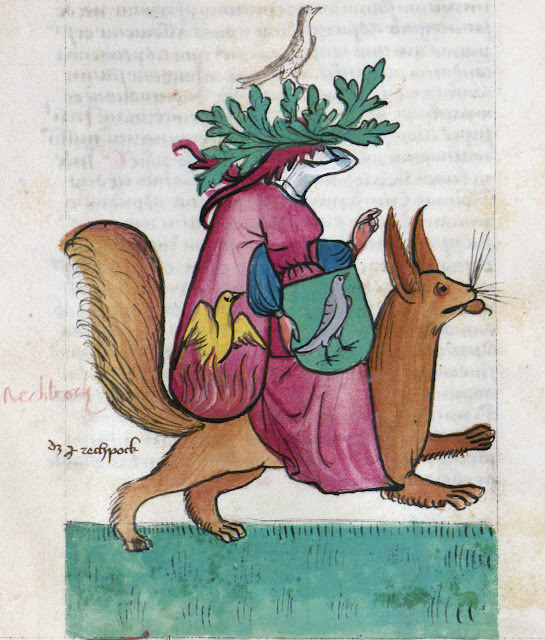 The snail does not affect rabbits or greyhounds. 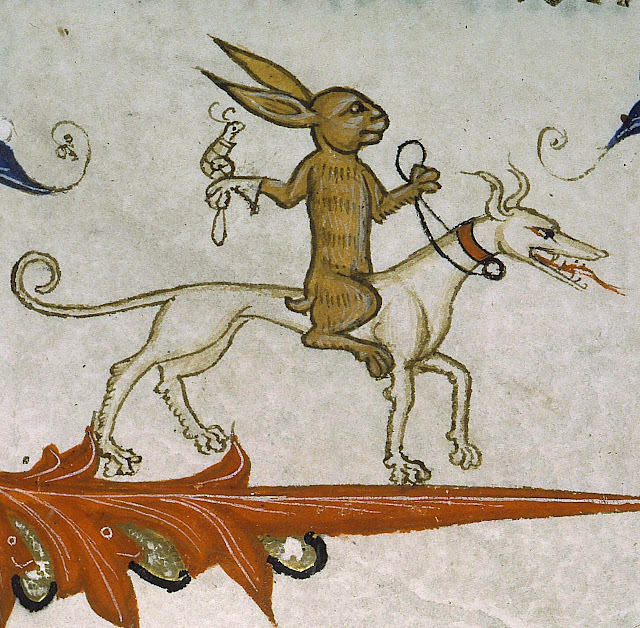 The rabbits will sell you one, but they will also suggest hiring a rabbit mercenary to deploy it for you. Right. So this is why you don't volunteer to help the wizard. Any more questions? Damage: 1d6 clawing or biting. For the fashionable lady-knight from Foreign Parts. The riding squirrel is a temperamental animal, likely to startle or flee from strange sights. Then again, so is horse, unless properly trained. And riding squirrels are definitely well trained. You probably can't afford one. They are very warm. And finally, God, here played by Sam Elliot, is absolutely fed up with the Devil. This is great. And a good reminder not to make medieval stuff too grimdark all the time. I really should write a post about that. No one knowns why knights are fighting snails? The Knights are the snails. Knights are a ubiquitous, obnoxious, and rather silly creature. Despite it's shell the snail must extend it's soft vulnerable fleshy self to get anything done and as such dooms itself. The knight facing the snail is facing his weakness and the comincal futility of his existence.Knights spend so much time and effort toiling and posturing over material matters and as monks know that's not what's important (otherwise man oh man are they wasting their time on religion and philosophy). Aha, but it doesn't explain the snail-falcon, or the knights riding snails, or the snail-nuns, or the naked knight jousting a rabbit. There might be deep meanings here... but why not take it at face value? it's funny. Rabbits are unclean animals in the Bible but in the west they are a symbol of abundance and fertility. The Knight is at battle with the flesh oce again while fighting the unclean but worldly order. But yeah, sometimes a tunnel in a dream or work of art has all sorts of psychological baggage, other times its just a tunnel. 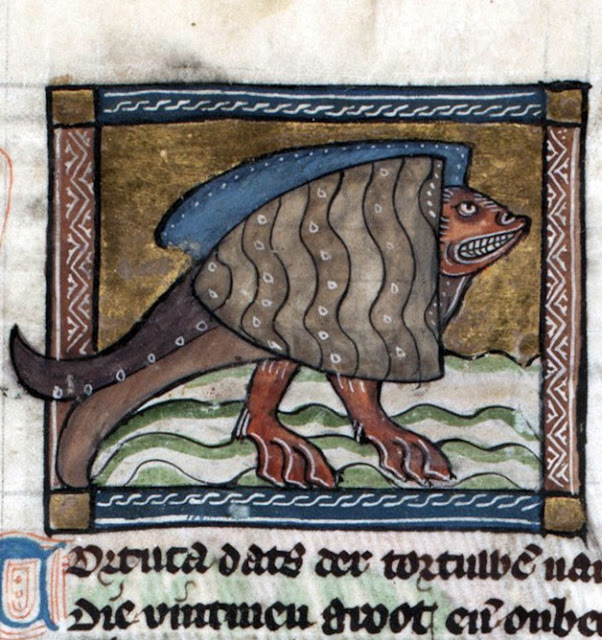 I'm slightly obsessed with the manuscript turtle but authentically perplexed by the artistic conventions as applied to snakes. 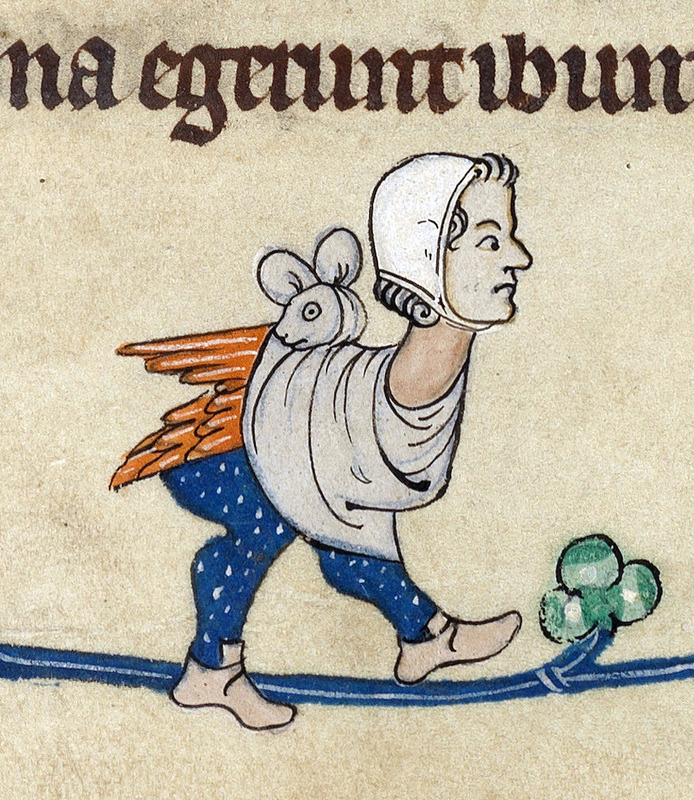 Very frequently they were depicted as having wings,paws,ears and fur. It's a kind of generic look (like a feathered wyvern) that can also be a crocodile or various other things . Wyvern is actually cognate with viper so that's where that comes from. 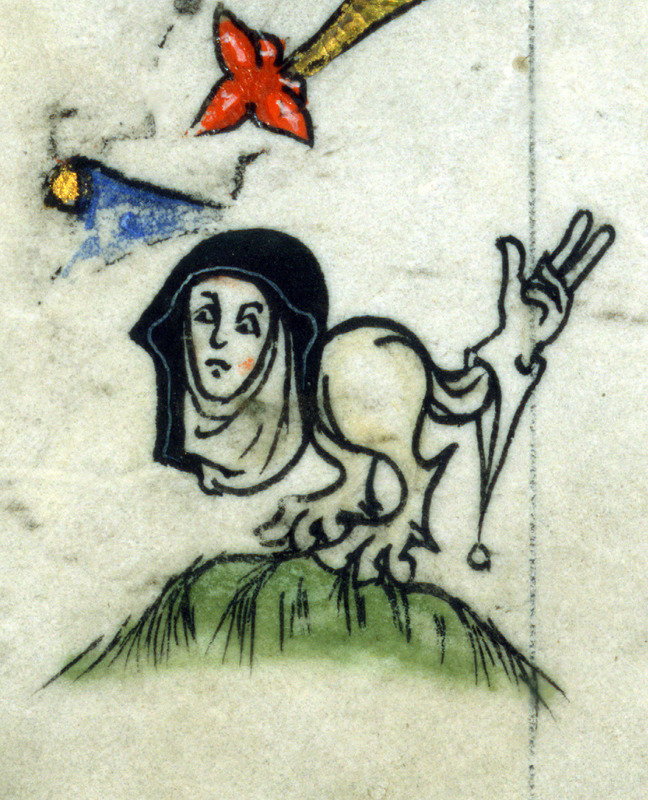 It's a snake as drawn by a mediaeval person.